When tasting tea, it is good to have a source of natural light in which to judge the leaves and the infusion, as well as the liquor. 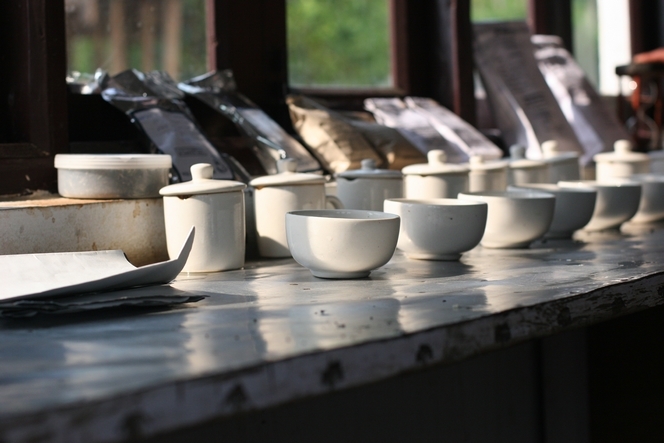 It means you can assess the tea not just on its taste and aroma, but also on its appearance. This is why, on most plantations, the tasting room has windows right down one side, to let in the sunlight. The cups of tea are placed along the windows, and while the tea is infusing, I can spread the dry leaves on a card in order to get a good look at them and judge the quality of the plucking. Or, while waiting for the timer to tell me when the infusion is ready, I can take my camera, as I did here in Darjeeling, and find the best angle to immortalise this beautiful morning light.